Price reveal in 10 minutes. the new renders look so good! oh man guys!! GB is in 3 days!! Yes! The drop should be public in a couple minutes. I was taking a siesta. eating too much jamón eh? The concept of siesta should be introduced in Canada, I know Americans will have riots against it if they find found this exists. By the way is the drop starting on 4th or today? As going public in few mins gives impression that we will be able to purchase it shortly, atleast thats how I see it. Either way thanks for bringing this to life, great work in creativity on this one. White accents got moved to jamonelties? I'm guessing this happened some time ago and I must've missed it. A shame, looks like I'm sitting this one out. Might get a couple ene survival kits still. Hot damn nice job keeping the prices low! Here we go people. It's happening. A bit harsh for 1 key. But if you dont like it then you dont like it. In case if I missed it in previous posts, whts the significance behined Ene survival kit? Its growing on me and may go 2 of those to cover my full size board, besides tkl. numpad and jamonalities. I think he isn't counting with price breaks. From the 250 to 500 MOQ there's a 15 USD price drop, that's a lot, and it's similar with the Jamonelties, there's an 8 USD price drop from 150 to 250. For 100 + 39.99 you get a base kit and a decently sized novelty kit. And that's not an optimistic estimation. It's a reference to the April Fools post that started all. That's also why the poll is titled "GMK Jamón - The pinnacle of keyset development"
Please consider splitting Numpad based on Jamón's performance. I'm sorry if it came off as passive aggressive and/or harsh. I rarely have any ill-intent towards anyone in this community, and my post was not an exception to that. Zam is right that I wasn't considering price breaks. I voiced my opinion because the rest of the jamonelties don't interest me, just the accent enter and esc do. Zam is also right that by setting up the kits as they are that there is more flexibility; it just happens that the flexibility does not apply in my use case scenario, which doesn't make his statement false for the greater community. I will say that i perhaps jumped the gun and should have waited to see what moqs were hit once the group buy had a week or so to run, but then again, it would no longer be in IC phase. No hard feelings intended. Will you post links here to deskpads/clothing etc if those materialize? Zambumon, would you be able to tell us how long this will run for? Deskpads: Those should be done at https://novelkeys.xyz, keep an eye to their social media & newsletter. Clothing: It was a joke. Metal keycaps that people voted for when somebody added them by mistake to the poll: I've got you XOXO. Ok, so a 2x ene survival kit planck will have homing in the zxcv row, right? Is R2,R3,R4,R1 order usable on cherry? Otherwise I will likely not use homing (and use keys from fourties kit instead). Could you make the description on the drop page more explicit? It could be interpreted as having one homing key per row (and the homing does not show much in the render). Thanks! Homing keys have always been R3, and it says "with a scooped key included" not "R1 to R4 with scoped keys included". That makes sense, thanks for clearing this up. I guess GMK doesn't even have a mould for R2 homing. I'm not a native speaker, so the drop description sentence wasn't 100% clear to me. So if I would want ene survival kit alpha setup for planck (with correct legends for default layout and default profile (R2,R3,R4,R4)), I need 2x ene+fourties+base. The Eñe kit was never meant to be a standalone one, but rather as a reference to the April Fools joke, it was made so one could replace all the 1U alphas, or the numpad numbers. Covering a Planck with two of them was a side effect, and it would be more optimal to just get a Core + Forties in that case. Got it, I'm just trying to figure out which kits I will need. Thanks for designing the set! Nice job on the pricing. I’ll have to jump on this one. Jumping in on this tomorrow!! Normally I'm against ABS keycaps as I live in a tropical country and I terribly hate shining keys. But yeah, will probably make an exception for this set. Those novelties alone are worth it. 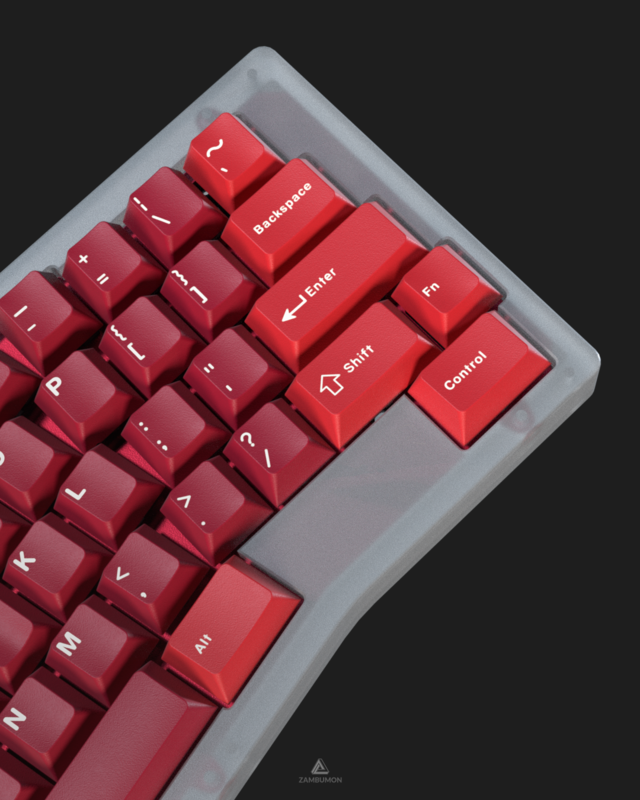 Sorry for not knowing gmk prices, but how does this compare to the 99 USD gmk BOW MD set which included at least base, numpad, iso and some space-bars? 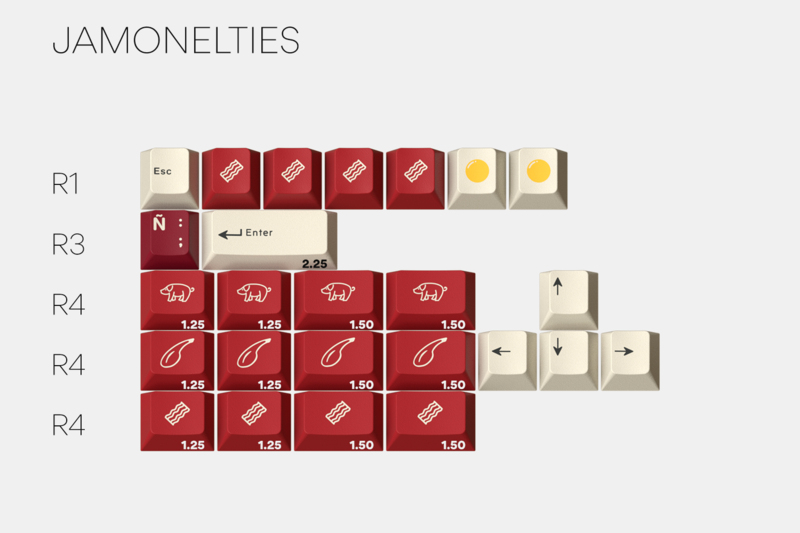 Massdrop has included 26 more keycaps than Jamón, out of those one is a 6.00U spacebar. Black on white only uses 2 colors (black and white) which are stock colors / Jamón uses 3 colors. Monochrome sets are cheaper. Massdrop doesn't pay the designer. / Massdrop pays the designer. Massdrop has (probably) bought 1000 units considering that they have already sold over 665 kits. / Massdrop hasn't bought any because the drop hasn't even started. That being said, Jamón's kit costs $90 at 1000 units. 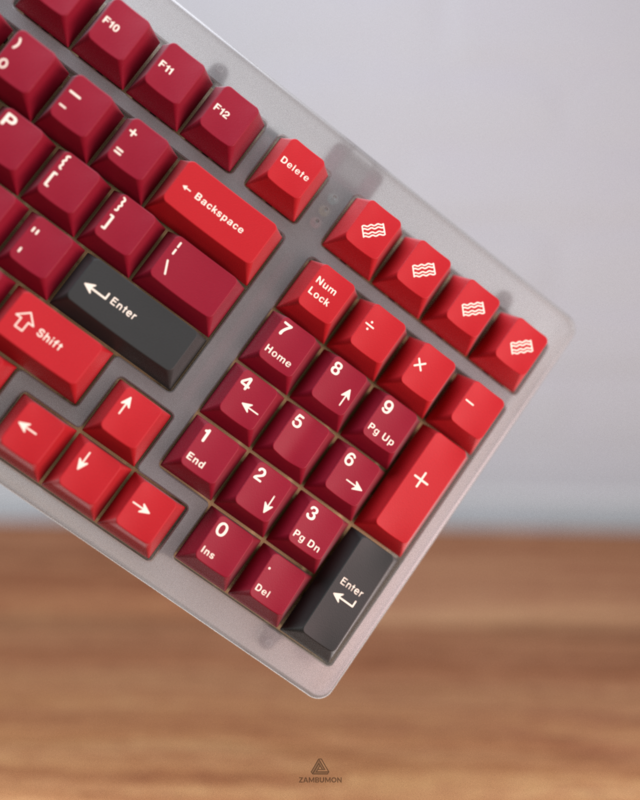 This is why Massdrop has labelled Jamón a "Massdrop x Designer GMK Name of The Set Custom Keycap Set" and white on black as a "Massdrop White-On-Black GMK Keycap set". Yay the drop is oipen on MD, now what is that promised surprise? Sweeeeeeeeeeeet, i dont see them in current drop page, I am assuming it will be added later. Deskmats group buy on Novelkeys! Novelties are always going to be more expensive than the average keys. They require special tooling to create, which incurs additional cost. Expecting specialized keys to be the same cost as the average set is kinda silly. I didn't say it was unreasonable that they cost as much as they do, just that I hope people pile on and hit higher MOQ's. Zam did a great job keeping down the cost on the rest of the kit, so if we can get the higher MOQ's for novelties it'll be a really affordable kit even with all the options!